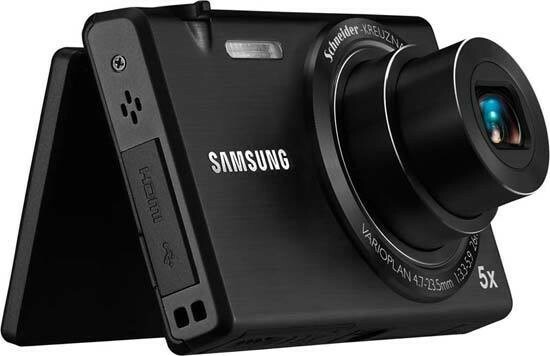 If point and shoot's your thing, then you'll be delighted with the new Samsung NV800, which offers by far the most hand-holding features that we've ever seen on a compact camera, coupled with a great touchscreen that largely succeeds in mimicking a smartphone. And that's not even mentioning the unique and very useful flip-out display which makes it easy to take a self-portrait and shoot from more obscure angles. It's not all a bed of roses - the image quality isn't that great, it's a little tricky to shoot from overhead and the price is high for a purely point-and-shoot model, but overall the MV800 is undoubtedly a very easy and surprisingly full-featured camera to use. In many ways the MV800 is very similar to the much cheaper ST95 model, which at half the price shares the same 5x zoom lens, 16 megapixel sensor and 3 inch touchscreen. If you don't buy into the flip-out screen design and don't mind sacrificing some of the multitude of auto-features, then the ST95 is a much more logical buy. On the other hand, the MV800 is even better suited to beginners with its unique screen and plethora of clever modes and creative effects. It can get a little bit overwhelming at first, with no less than 32 modes, effects and options on offer, but spend a little time exploring and you'll soon find your favourites. £249.99 / $279.99 is a lot to ask for a compact camera with so-so image quality and only a 5 x zoom lens, so its vital that the MV800 delivers on its main aim of being the ultimate point and shoot. Happily it largely succeeds on that promise, allowing us to recommend the Samsung NV800 as a great social camera with a literal twist.